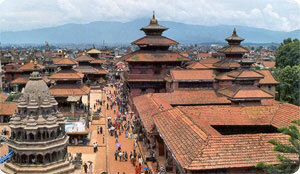 Day 02: Sightseeing to Bhaktapur. Day 03: Sightseeing to Pashupatinath, Bouddhanath, Patan & Swayambhunath. Day 04: Drive to Pokhara & transfer to hotel. 01 hour boating on Phewa lake. Day 05: Day free for personal activities. Day 06: Drive to Chitwan & transfer to hotel. Jungle activities in Chitwan National Park. Overnight at hotel. Day 07: Drive to Katmandu , transfer to hotel and farewell diner. Day 08: Back to onward destination.